For the past few years, I have posted my list of New Year’s resolutions. Writing my resolutions down and posting them for the world to seems to makes me feel more accountable. In 2012, my big resolution was to start a podcast – and look at Young PR Pros today. In 2013, my big resolution was to do more videos – which brought me to #CPRS2013. Similarly to last year, I have decided to divide my resolutions in to buckets – personal, professional, social, etc. – and make them smaller and more attainable. I want to make sure my previous resolutions don’t go to waste, so this year, it is all about improvements. In high school I was a band geek. I played the saxophone. Now, almost 10 years later, I want to get back in to music. I have always had a passion for the violin. A couple of months ago, I bought a student violin, it isn’t fancy, but it works. This month I start my first violin lesson. Maybe by the end of 2014 I can post a video of myself playing the violin that doesn’t sound like a dying cat. I have preached it for years now – if you are a communicator you MUST be up-to-date with your current affairs, both nationally and internationally. But, I don’t always practice what I preach. In 2014, I have organized a little morning routine that allows for 1 hour of reading the news. And I don’t mean skimming. I find my generation doesn’t read enough, we always know a little about a lot. When I read the news in 2014, I am going to read full articles. I will also start to read the Economist and the New Yorker on a regular basis. It is official, I am running another marathon. This will be my third marathon since 2009. And, of course, I will be running it with my mom, also known as @OttawaDeafGirl (check out her blog!). This marathon will be different for a one special reasons: my mom is turning 50 and I will be running by her side as she completes a marathon in her 50th year. There might be a website redesign coming to Young PR Pros. My co-host, Julia Kent, and I also saw that our listeners loved the Take uOPRA to Work Day series, so stay tuned for similar series in 2014. We also plan on connecting more with our listeners. You might here some new voices on the show as we bring listeners on air to talk about what they are doing in the world of PR and communications. I am no Julia Kent, I can’t read 25 books in a year. Instead of making a goal I cannot possibly attain, I have decided to choose two books that I MUST read by the end of 2014. I have chosen the Hunger Games series (currently I am already done book 1 and 2) – my pop culture reference for the year. And, Lean In by Sheryl Sandberg – a book about leadership for women. As I mentioned, this year is about improvements. Therefore, my goal for 2014 is to grow the Impaired Speed Skating Association of Canada, of which I am a Director. I hope to welcome a new skater in 2014 and expose the organization to young athletes and instill new hope in youth with disabilities. 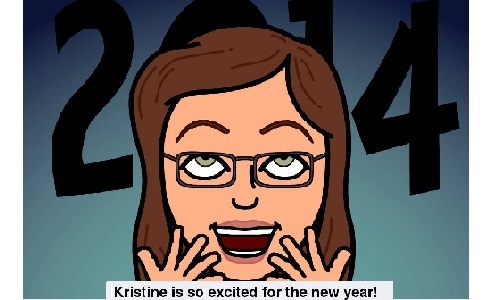 Great resolutions Kristine! Although many people think resolutions are “too much” or only said to be broken, I believe if you set some measurable ones, it works better! I’m sure you’ll accomplish all your resolutions, or at least work towards them. If you get to be good at the violon for August 2014, we could use some music entertainment for our special day 😉 And I’ve read Lean In, it’s inspirational. I’ll definitely follow you (via Skype! haha) through your marathon work outs. If I get good at the violin I would be honoured to play at your special day, but I heard it takes several years to drown out the dying cat sound. So far I have been successful in accomplishing all my goals from previous years. This year’s list is a tad longer, but I have really great friends (you!) and family you encourage me every step of the way! Proud of you!!! I’m sure you can do all these things! You are so inspiring and determined, I’m quite confidant you’ll achieve all these goals! Definitely read Lean In. I recommend it highly. Then when you’ve read it..lean in! Thanks Sherrilynne. I look forward to it!